On Friday our Tico friends had the surround sidewalk completed just in time for us to say goodbye and do one last group prayer around the pool. 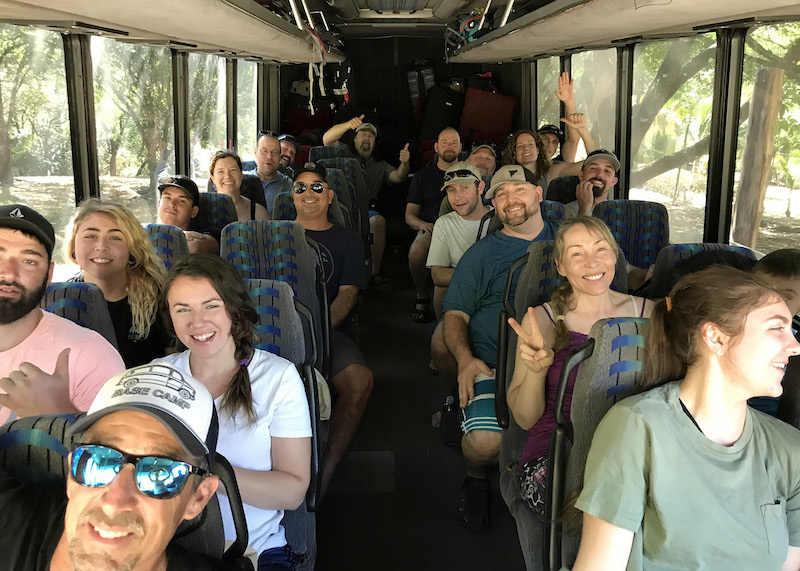 After breaking down camp and cleaning up the tools, we packed onto the bus to head for a debriefing at Samara Beach, which was about 45 minutes away. 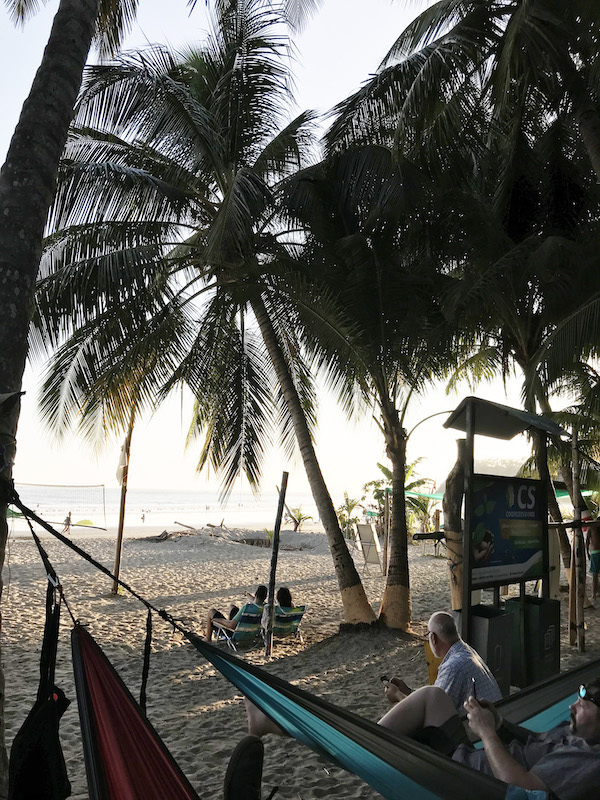 After checking in to our hotel, we set up our “hammock city” by the beach for some well deserved R & R. It was awesome having the opportunity to share all the great things God did for us this week. After going our separate ways for dinner (our MN team went for an Argentine BBQ), we got together to debrief and talk through what we’d each be taking away from the week. We also discussed how we can each continue to serve and share our faith with others when we’re home. Some really deep moments were shared, along with a lot of laughs. On Saturday we were up bright and early as usual. Everyone left to do various group activities, enjoying the beauty that Costa Rica has to offer. Rod, Steph, and I headed out in Kayaks. While Eric, Harold, and Rob chilled out under the palm trees and made sure no one ran off with our hammocks. 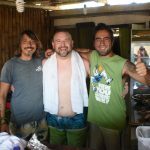 As we were returning from our kayak journey, the waves got pretty big and all three of us managed to get rolled over in the incoming surf. Thank God for no injuries; I watched that kayak chasing me down the wave! In the afternoon we met Mike and Linda, some friends of Pastor Dan (Alaska) who recently moved to Costa Rica. They’ve spent many years serving on Missions projects and boards. Linda was diagnosed with early onset Alzheimer’s and given three to six years to live. They’re currently in year three. They shared how this tragic disease has taught them to think in “forever.” Our lives on earth are such a small part of “forever.” Wise words as we wrapped up a week of serving in many capacities, with eternal consequences. Curtis Burnam, one of the missionaries we support at ROL, coordinates this Costa Rica project. He was raised in a missionary family in Columbia, so he’s fluent in Spanish (it’s actually his first language). Simply put, he’s amazing. God has gifted him and has a special calling on his life, he never seems to grow weary. On Sunday, Curtis made arrangements with some local beach folk to make us a BBQ on the beach for lunch as our final send off. Costa Ricans, by nature, are extremely hospitable and friendly. This is even more evident when you’re in Samara Beach with it’s laid back vibe. The locals were thrilled to BBQ for us and it was so good! It got even better when some of the guys were able to share the gospel with them. We also prayed over them. We see this same group of guys every year, so we’ll continue to pray for their salvation and that their minds will be opened to the truth. Our MN team said our goodbyes and were off to return to the frozen north. Team “Frozen Chozen” was a GREAT group to serve with. Thank you Rob, Harold, Eric, Rod, and Stephanie for all your hard work and for your genuine hearts that you so willingly shared. It was an honor to serve with you all! Most of all, thank you River of Lifers for praying for us on this journey! God’s hand was definitely upon us.